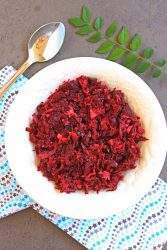 The bright and vibrant Beetroot Poriyal with Onion | Beetroot Stir Fry is a perfect side dish with any meal. Perfect for the Fall weather. I used my instant pot to cook the beetroot. Wash and remove the ends from the beetroot. Place them in a bowl with water and cook it pot in pot in the instant pot. I cooked it at manual setting for 15 minutes. When the pressure releases, drain the cooked beetroot and let it cool down until we can handle it. Peel the skin of the beetroot and grate it. Since the beetroots are already cooked it will be very easy to peel and grate. In a medium pan, heat the oil. Add the mustard seeds, cumin seeds and urad dal and let it fry for a minute. Add the curry leaves and green chilies and fry for about 10 seconds. Then add the sliced onions and saute until the onions are translucent. Add the grated beetroot, salt and sugar (if using) and mix well. Let it cook on medium flame for 5 to 7 minutes or until the moisture dries out a bit from the vegetable. Add the grated coconut (if using) and give it one last mix. Turn off the flame and serve!